Jaguar brought a couple examples of their brand new F-Type roadster, a copper colored V6 model in S trim, and this lovely metallic blue V8S. The major visual differences between the six pot and eight pot models is at the back, where the six has center-mounted dual exhausts while the eight cylinder models have two pairs of exhaust tips that flank the rear end. I think the F-Type is gorgeous in person, possibly better looking than even the iconic E-Type, the F’s spiritual ancestor. Yeah, it’s true that the F-Type evokes a bit of the BMW Z8 around the rear end, but who’s to say that the Z8 itself wasn’t influenced by the E-Type? 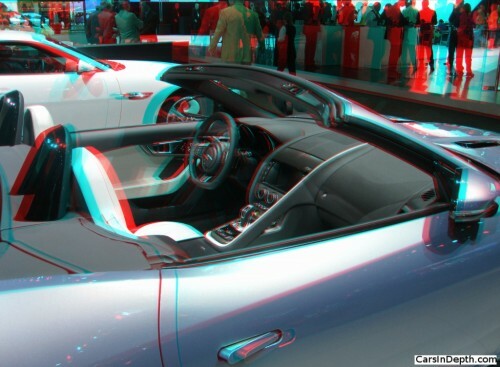 Walking around the car, you see that it has rather tidy but still sensuous lines. Using a clamshell hood, hinged at the front, which gives the front end a very clean look, was a challenge. 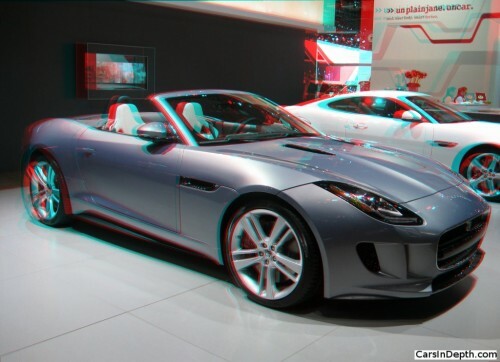 The F-Type’s hood/bonnet is supposedly the largest single piece aluminum stamping used in automobiles today. Jaguar designers talk about the F Type’s two “heartlines”, the two creases that define the front and rear fender lines, and while that designspeak gets a bit tiresome, the F Type’s looks will never be tiresome. I don’t know that 50 years hence that it will be the automotive icon that the E Type has become, but to me, right now, the F-Type is the new car that I most lust after. 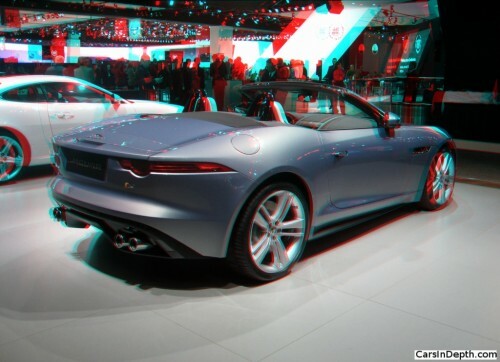 This entry was posted in 3D Imagery, 3D Photos, Jaguar and tagged F-Type V8S, Jaguar F-Type. Bookmark the permalink.